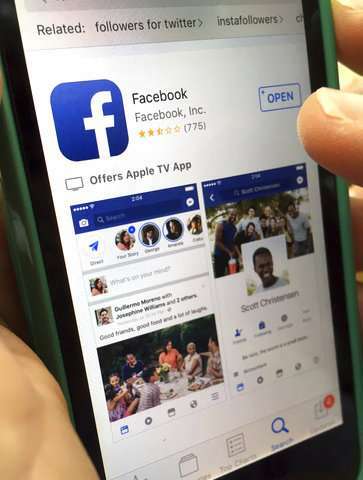 Facebook said Tuesday that it deleted about 66,000 posts a week in the last two months as the social media giant cracks down on what it deems to be hate speech. The company said in a blog post that deleting posts can "feel like censorship," but that it is working on explaining its process better and improving its enforcement of hate speech. Facebook defines hate speech as attacks on people based on their race, sexual orientation and other "protected characteristics." The Menlo Park, California, company said it mostly relies on its 2 billion users to report any hateful posts they see. Workers then review the posts and decide whether to delete it. Facebook Inc. said it plans to hire an additional 3,000 people in the next year to review posts. That's on top of the 4,500 people it currently has reviewing posts. It has made mistakes, the company said. Last year it deleted the post of a black activist, who had posted hate mail he received that included slurs. Facebook said it restored the post and apologized. "We know that these kinds of mistakes are deeply upsetting for the people involved and cut against the grain of everything we are trying to achieve at Facebook," said Facebook Vice President Richard Allan, in the blog post. Almost all tech companies with a social media side are wrestling to find the balance between allowing for free speech, and tamping down on extremism. Last week, Google said it was cracking down on terrorist propaganda and other extremist videos on its YouTube site amid intensifying criticism about the internet's role in mass violence. It also said it was hiring more people to monitor hate and extremism online, and to prevent its dissemination through YouTube. Hate is hate, whether directed at Trump, Muslims, God or any. It represents a nature of the individual. It can create upset, it can cause wither the person making the statement or another to take up the initiative and engage in malignant behavior. James Hodgekinson appears an eminent example of what the literal and provable torrent of hate filled rhetoric and doggerel against Trump can lead to. Is Facebook acting to control the reams of venom against Trump? Like saying he has small hands? And the literal frothing at the mouth behavior of those who cannot speak about God without viciousness. Resorting to lies like, "all the world's wars were caused by religion", and invoking Christopher Hitchens' depraved tenet that, if someone does not provide proof of what they say to another's satisfaction, that automatically disproves the statement? To extend the "hate speech" convention only to "protected groups" automatically says that certain groups deserve hate. Just another means for some to control political opinion. And you know who.